Gloria Maender also contributed to this piece. Sea otters living along the central California coast risk higher exposure to disease-causing parasites as a consequence of the food they eat and where they feed. 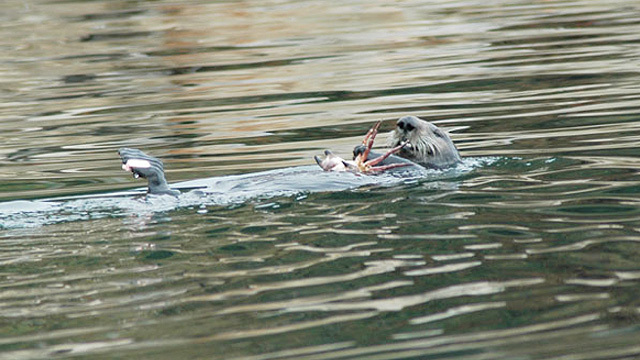 Sea otters that eat small marine snails are at a higher risk of exposure to Toxoplasma gondii, a potentially deadly protozoal pathogen, than animals that feed exclusively on other prey, while sea otters living along the coast near San Simeon and Cambria are more at risk than otters that live outside this area. Similarly, sea otters that commonly feed on clams and fat innkeeper worms at the southern end of Monterey Bay have a higher risk of exposure to another dangerous protozoal pathogen, Sarcocystis neurona. On the other hand, sea otters whose diet includes significant amounts of abalone, a preferred prey species when sufficiently abundant, have a very low risk of infection with either pathogen. T. gondii and S. neurona both have complex life cycles involving multiple hosts. They complete their life cycle in their respective final hosts, cats (T. gondii) and opossums (S. neurona), which then shed new infective life stages of the parasites into the environment. These infective oocysts can persist for months in the environment outside a host. Although these parasites are believed to have land origins, many oocysts end up in the marine environment, where they can be consumed by invertebrates in the marine food web, Tinker said. While invertebrates are not themselves affected by the parasites, invertebrates can act as intermediate or transport hosts, and sea otters that become infected from consuming infected prey may eventually die from protozoal encephalitis (inflammation of the brain). Complete findings appear in the Proceedings of the National Academy of Sciences. The article, titled “Prey choice and habitat use drive sea otter pathogen exposure in a resource-limited coastal system” (v. 106, no. 7, p. 2242-2247, URL http://dx.doi.org/10.1073/pnas.0806449106), was authored by Christine K. Johnson, University of California, Davis; Martin T. Tinker, U.S. Geological Survey; James A. Estes, University of California, Santa Cruz; Patricia A. Conrad, University of California, Davis; Michelle Staedler, Monterey Bay Aquarium; Melissa A. Miller, California Department of Fish and Game; David A. Jessup, California Department of Fish and Game; and Jonna A.K. Mazet, University of California, Davis. 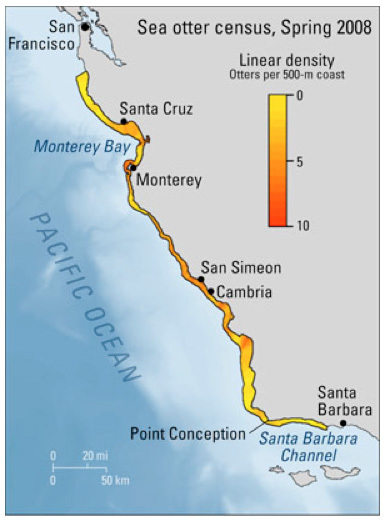 Generalized map of California coast, showing spatial variation in population density of sea otters as determined from the spring 2008 sea otter census. Population growth has been sluggish in the center of the range (Monterey to Cambria), where sea otter densities are highest and most reproduction occurs. Dietary diversification in densely populated areas may be making sea otters there more vulnerable to infectious diseases.